Largely eclipsed by the military’s crackdown on Muslim Brotherhood protest camps in Cairo and resulting loss of life, more than 20 churches in a number of provinces were reported to have been targeted for arson and other attacks. Through the day news reports and social media posts drew attention to individual incidents and it soon became apparent that a concerted campaign of coordinated attacks was underway. Most of the targeted churches were Coptic Orthodox, but Catholic churches were also attacked as well as at least one Protestant church. "Western leaders...seem to be more interested in protecting the rights of those who persecute Christians"
One of the groups monitoring the situation through contacts on the ground, the Australian Coptic Movement Association (ACM), released a list of 16 churches and related sites attacked, and said the true figure could reach 40. 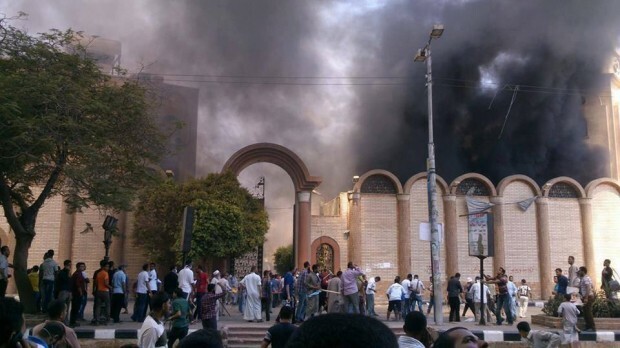 Three churches were torched in Sohag province further to the south, a church, convent and school were set alight in the eastern province of Suez, as were a church and Bible Society premises in Fayoum province, west of the capital. It also reported assaults at a church in Alexandria. According to Egypt’s independent Mideast Christian News service, eyewitnesses to one of the church attacks in Sohag reported seeing Muslim Brotherhood supporters hijack a fire truck to prevent it from attending the fire. Ramez Atallah, general director of the Bible Society of Egypt, said two “very beautiful, fully equipped” Bible Society bookshops, in Minya and Assiut, were among the buildings that were torched and destroyed. “Fortunately we were closed today, fearing such an attack, so none of our staff were injured. The attackers demolished the metal doors protecting the bookshops, broke the store windows behind them and set the bookshops on fire,” he said. Atallah said this was the first time the Bible Society had been victim of such attacks in its 129-year history in the country. It said the government had failed to protect Christians despite Islamists’ threats and incitement over recent weeks. “The pro-Morsi supporters and Muslim Brotherhood leaders have been inciting hatred and violence against Egypt’s Coptic Christians and now we are seeing those threats acted on in an unprecedented way. Last week more than a dozen Egyptian human rights groups accused Islamists of inciting violence against Christians and the interim government and security forces of not protecting members of the vulnerable minority or acting against the perpetrators.